2. formation of an infarct. cerebral infarction an ischemic condition of the brain, causing a persistent focal neurologic deficit in the area affected. myocardial infarction see myocardial infarction. pulmonary infarction localized necrosis of lung tissue caused by obstruction of the arterial blood supply, most often due to pulmonary embolism. Clinical manifestations range from the subclinical to pleuritic chest pain, dyspnea, hemoptysis, and tachycardia. 1. An area of tissue necrosis caused by impairment of arterial or venous blood supply due to mechanical factors (for example, emboli, thrombi) or to blood pressure alterations. 1. the formation of an infarct. acute myocardial infarction (AMI) that occurring during the period when circulation to a region of the heart is obstructed and necrosis is occurring. mesenteric infarction coagulation necrosis of the intestines due to a decrease in blood flow in the mesenteric vasculature. migrainous infarction a focal neurologic defect that constituted part of a migrainous aura but that has persisted for a long period and may be permanent. myocardial infarction (MI) gross necrosis of the myocardium, due to interruption of the blood supply to the area. 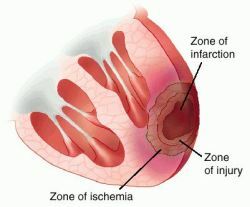 Myocardial infarction shown in cross-section of heart (ventricles only). non–Q wave infarction myocardial infarction not characterized by abnormal Q waves. pulmonary infarction localized necrosis of lung tissue, due to obstruction of the arterial blood supply. Q wave infarction myocardial infarction characterized by Q waves that are abnormal either in character or number or both. silent myocardial infarction myocardial infarction occurring without pain or other symptoms; often detected only by electrographic or postmortem examination. watershed infarction cerebral infarction in a watershed area during a time of prolonged systemic hypotension. 1. The formation or development of an infarct. 2 the development and formation of an infarct. Kinds of infarction include myocardial infarction and pulmonary infarction. 1. Sudden insufficiency of arterial or venous blood supply due to emboli, thrombi, vascular torsion, or pressure that produces a macroscopic area of necrosis; the heart, brain, spleen, kidney, intestine, lung, and testes are likely to be affected, as are tumors, especially of the ovary or uterus. Death of tissue from deprivation of its blood supply. Reperfusion of an occluded coronary artery before damage is done to the muscle that receives blood from that artery. A myocardial infarction whose symptoms begin within an hour of vigorous physical exercise. A massive stroke involving the middle cerebral artery, in which swelling of the brain leads either to herniation and death or to additional strokes in other arteries. Proven risk factors for MI are tobacco use, diabetes mellitus, abnormally high cholesterol levels, high blood pressure, gender, advanced age, obesity, physical inactivity, chronic kidney disease, a family history of MI at an early age, and loss of albumin in the urine. Some research suggests that high C reactive protein levels, and other conditions may also lead to increased risk. Classic symptoms of MI in men are a gradual onset of pain or pressure, felt most intensely in the center of the chest, radiating into the neck, jaw, shoulders, or arms, and lasting more than a half hour. Pain typically is dull or heavy rather than sharp or stabbing, and often is associated with difficult breathing, nausea, vomiting, and profuse sweating. Clinical presentations, however, vary considerably, and distinct presentations are seen in woman and the elderly, in whom, e.g., unexplained breathlessness is often the primary symptom. Many patients may mistake their symptoms for indigestion, intestinal gas, or muscular aches. About a third of all MIs are clinically silent, and almost half present with atypical symptoms. Often patients suffering MI have had angina pectoris for several weeks before and simply did not recognize it. A compatible history associated either with segment elevation (on a 12-lead electrocardiogram) or with elevated blood levels of cardiac muscle enzymes such as troponins or creatine kinase can establish the diagnosis. An ST-segment elevation of more than 1 mm above baseline in at least two contiguous precordial leads or two adjacent limb leads suggests myocardial injury. 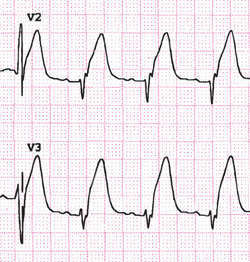 Myocardial infarctions with this presentation are known as ST-segment elevation MI (STEMI). This finding usually indicates significant muscle damage in the infarct area, a poorer prognosis, and a higher incidence of complications (arrhythmias, cardiogenic shock) than in a non-ST-segment elevation MI (NSTEMI). The differential diagnosis of chest pain must always be carefully considered because other serious illnesses, such as pulmonary embolism, pericarditis, aortic dissection, esophageal rupture, acute cholecystitis, esophagitis, or splenic rupture may mimic MI. Myocardial infarction is a medical emergency; diagnosis and treatment should not be delayed. People who experience symptoms suggestive of MI should be taught to call 911 immediately and chew and swallow aspirin. Oxygen is administered at 4 L/min as soon as it is available. History is gathered throughout the first few minutes after admission even as a 12-lead ECG is being done and blood taken for biomarkers. Cardiac troponins may not become elevated until 4 or more hr after symptoms begin. If the patient is hypotensive or in cardiogenic shock, right-sided ECG leads are assessed for a right ventricular (RV) infarct. An intravenous access is established along with continuous cardiac monitoring, and medications (which may include chewed aspirin [162 to 325 mg], heparins, or other medications to inhibit platelet aggregation, nitroglycerin [given SL, sprayed or IV], IV morphine, and beta-blockers) are administered as prescribed. Pain is assessed on a 1 to 10 intensity scale, and morphine 2 to 10 mg administered IV, with incremental doses of 2 to 8 mg every 5 to 15 min until relief is obtained. Beta-blockers (such as metoprolol or atenolol) decrease myocardial oxygen demand, helping to limit the amount of heart muscle damaged. An IV beta-blocker should be given if the patient is hypertensive or has a tachyarrhythmia as long as no contraindications exist. Patients with STEMI who arrive at the hospital within 6 hr of the onset of symptoms are treated with fibrinolytic therapy or percutaneous coronary intervention (PCI). The goal for administration of fibrinolytic therapy is 30 min postsymptom onset (door-to-needle); for PCI 90 min (door-to-balloon inflation). Absolute contraindications of fibrinolytic therapy include previous intracranial hemorrhage or ischemic stroke within 3 months ( intracranial malignancy), active bleeding, or bleeding disorders (except menses), significant closed head or facial trauma within 3 months (known structural cerebral vascular lesions), and suspected aortic dissection. Reperfusion is the immediate goal, usually best accomplished with balloon angioplasty and endovascular stent placement, although emergency coronary bypass surgery may be needed in cases when PCI fails. An angiotensin-converting enzyme (ACE) inhibitor is administered within 24 hr of a STEMI to suppress the renin-angiotensin-aldosterone system and prevent excess fluid retention. ACE inhibitors also prevent conversion of angiotensin I to angiotensin II (a potent vasoconstrictor), thus reducing afterload to help prevent heart failure. In MI complicated by pulmonary edema, diuretics are administered, and dobutamine infusions may be necessary to increase cardiac output. Strict glucose control (maintaining blood sugars below 150 mg/dl, and preferably in the normal range) reduces mortality in acute MI. Hypotension and circulatory collapse frequently occur in patients with significant RV infarctions, and fluid challenge is administered to optimize RV preload. If this is unsuccessful, the patient with an RV infarct will require inotropic support, correction of bradycardia, and measures to achieve atrioventricular synchrony (cardioversion for atrial fibrillation, etc). In patients with ventricular arrhythmias, defibrillation, or cardioversion, lidocaine, vasopressin, or amiodarone infusions, or other drugs, may be necessary. Anemic patients (hematocrit less than 30 or those actively bleeding) benefit from blood (packed red cell) transfusions. With contemporary care, about 95% of patients with acute MI who arrive at the hospital in time will survive. These patients are referred to nutrition therapists to learn how to use low-fat, low-cholesterol diets, and to cardiac rehabilitation programs for exercise training, tobacco cessation, and psychosocial support. Acute Care: On admission, all diagnostic and treatment procedures are explained briefly to reduce stress and anxiety. Continuous electrocardiographic monitoring is used to identify changes in heart rhythm, rate, and conduction. Location, radiation, quality, severity, and frequency of chest pain are documented and relieved with IV morphine. Bleeding is the most common complication of antiplatelet, anticoagulant, and fibrinolytic therapies. The complete blood count, prothrombin time, and activated partial thromboplastin time are monitored at daily intervals. IV sites are assessed for evidence of bleeding. Fluid balance and pulmonary status are closely monitored for signs of fluid retention and overload. Breath sounds are auscultated for crackles (which may resolve by having the patient cough when caused by atelectasis, or which may indicate pulmonary edema when they do not). Heart sounds are auscultated for S3 or S4 gallops or new heart murmurs. Patient care and other activities should be organized to allow for periods on uninterrupted rest. Stool softeners are prescribed to prevent straining during defecation, which can cause vagal stimulation and slow the heart rate. Antiembolism stockings help to prevent venostasis and deep vein thrombosis. Emotional support is provided to decrease stress and anxiety. Adjustment disorders and depression are often experienced by MI patients, and the patient and family are assisted to deal with these feelings. Stress tests, coronary angiography, cardiac imaging procedures, reperfusion techniques, and other interventions are explained. The patient receives assistance in coping with changes in health status and self-concept. Ambulatory Care: Cardiac rehabilitation begins as soon as the patient is physiologically stable. The goal of cardiac rehabilitation is to have the patient establish a healthy lifestyle that minimizes the risk of another MI. Ambulation is slowly increased, and a low-level treadmill test may be ordered before discharge to determine exercise tolerance and the risk of future heart attacks. Patients are taught not only to measure their pulse but also to assess their response to exercise in terms of fatigue, ease of breathing, and perceived workload. Following discharge, exercise is slowly increased, first while being monitored closely by supervised cardiac rehabilitation, and then more independently. The patient also receives information about a low saturated fat, low cholesterol, low calorie diet, such as the DASH eating plan (Dietary Approaches to Stop Hypertension), resumption of sexual activity, work, and other activities. The patient is taught about desired and adverse affects of all medications: aspirin therapy is usually prescribed as ongoing antiplatelet therapy (with or without clopidogrel), but patients should be warned about the risk of bleeding and be advised to avoid products containing ibuprofen, which blocks aspirin’s antiplatelet effects. Smoking cessation is an important preventive for future MIs. High blood pressure, obesity, adverse cholesterol levels, and diabetes mellitus also should be carefully managed to help prevent future MIs. Alcohol intake should be limited to 1 drink daily (women), 2 drinks daily (men). Opportunities are created for patients and families to share feelings and receive realistic reassurance about common fears. A localized necrotic area caused by abruption. An infarction in the lung usually resulting from pulmonary embolism that may appear on x-rays as a wedge-shaped infiltrate near the pleura. Immediate therapy includes control of pain, oxygen administered continuously by mask, intravenous heparin (unless the patient has a known blood clotting defect), and treatment of shock or dysrhythmias, if present. Unrecognized myocardial infarction. The patient may experience difficulty breathing, heartburn, nausea, arm pain, or other atypical symptoms. The deprivation of a part of a tissue or organ of its blood supply so that a wedge-shaped area of dead tissue (an infarct) forms. Infarction of part of the heart muscle is the process underlying a heart attack. Death of tissue due to inadequate blood supply. Area of tissue necrosis caused by impaired arterial or venous blood supply due to mechanical factors (e.g., emboli, thrombi) or to blood pressure alterations. see myocardial infarction (below) and also myocardial infarction. an ischemic condition of the brain, causing a persistent focal neurological deficit in the area affected. an aseptic fever caused by liberation of pyrogens from damaged tissue. a common occurrence in horses due to occlusion of arteries by larvae of Strongylus vulgaris. Sections of intestine, sometimes very large ones, become devitalized leading to peritonitis and death. May also result from torsion or strangulation. See also thromboembolic colic. gross necrosis of the myocardium, due to interruption of the blood supply to the area. See also myocardial infarction. localized necrosis of lung tissue, due to obstruction of the arterial blood supply. is usually conical, anemic and multiple and may heal leaving a narrow scar. It is usually clinically inapparent unless the obstructing material is infected. This leads to the development of renal abscess or embolic nephritis, also usually without clinical signs unless the abscesses are large or numerous. caused sometimes by fibrocartilaginous emboli of prolapsed disk material, causing sudden loss of function of large sections of the spinal cord, leading to flaccid paralysis of the hindlimbs or of all four, depending on the site of the infarct. usually hemorrhagic; may be difficult to differentiate from subcapsular hematoma. a thrombus in a vein may cause infarction, e.g. in the thigh muscles of downer cow, recumbent for long periods, or in the gastric mucosa of pigs, where it is a common finding in acute septicemia.